The name may sound a little cold, but Inspire ICE braces are the hottest new braces on the market. Inspire ICE braces are comfortable, smaller than the average metal bracket, and best of all, they are virtually invisible, so your family and friends may never even know you’re wearing braces! Inspire ICE braces are made of patented sapphire material, making them the only crystal-clear braces available. Some aesthetic braces are white or colored to match a particular tooth color. 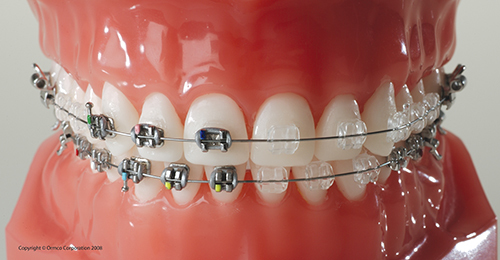 But since we all have different tooth shades, these braces frequently stand out. Inspire ICE crystal-clear braces are the most discreet braces available, regardless of tooth color. Plus, they won’t stain or discolor over time, so you’ll look great throughout your treatment. Clear aligner treatment may sound like a good alternative to metal braces, but they also require a high level of compliance. Will you always remember to put your aligners back in after you’re done eating dinner? With Inspire ICE, you’ll enjoy uncompromised results that only real braces can deliver, with the aesthetics you demand. It’s never too late to have the smile you’ve always wanted. Inspire ICE braces can give you beautiful results that will last a lifetime. Ask us about Inspire ICE braces during your consultation!